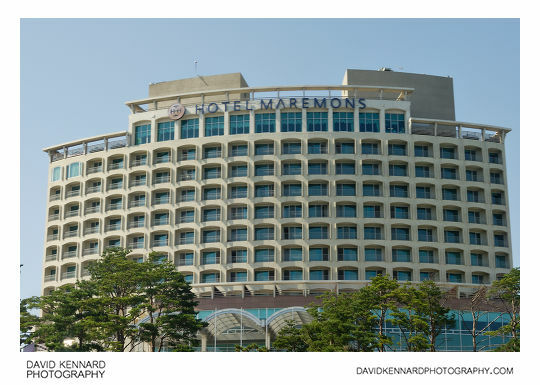 As the bus went further north into Sokcho, we passed the Hotel Maremons (above), which is a relatively new hotel. 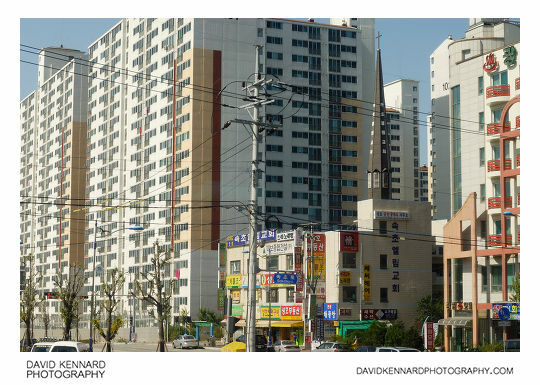 The area around the coast of Sokcho seems to be filled with many hotels. 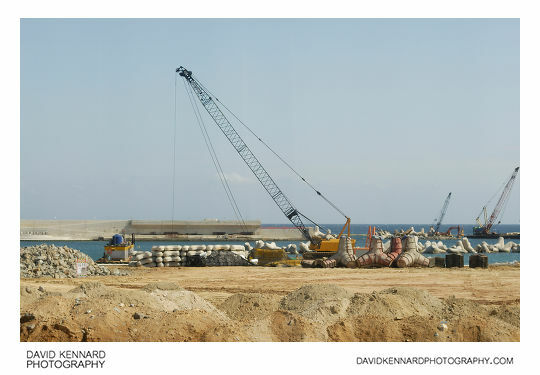 In the photo above you can see some of the work they were doing in constructing an enlarged parking area for Daepohang (대포항), a popular shopping area for seafood. Getting further into the city, the buildings start to be packed together more closely. You can see above a set of large apartment buildings, and in the foreground is a smaller building that contains shops and a church. An unusual combination I don't think I've seen in the UK. 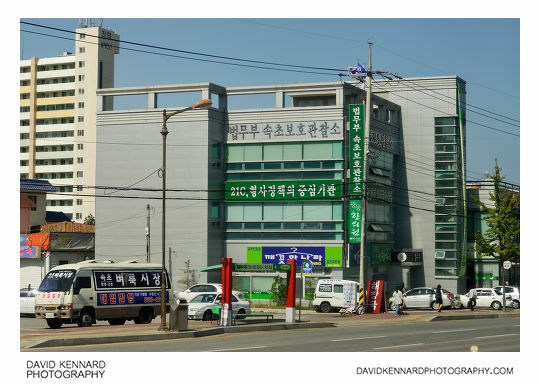 A bit further on and we pass a building holding the Sokcho department of Justice probation offices (Hangeul: 법무부 속초보호관잘소), along with a variety of shops. 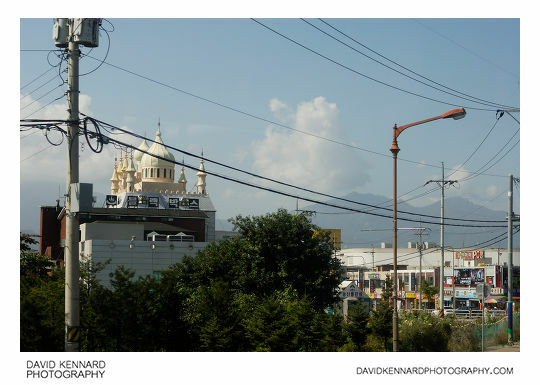 Nearly coming up to Sokcho bus station, which was the bus' destination, from here you can see the distinctive domed top of the Samsung Motel (Hanguel: 삼성모텔). I'm not sure why the hotel is designed like that though, reminds me more of Russian architecture than Korean. We had left Seoul Bus station at 9am, and arrived at Sokcho bus station around 12.30pm. We found the tourist information desk nearby, and they told us which bus to take to get to Seoraksan National Park (which was our intended destination). 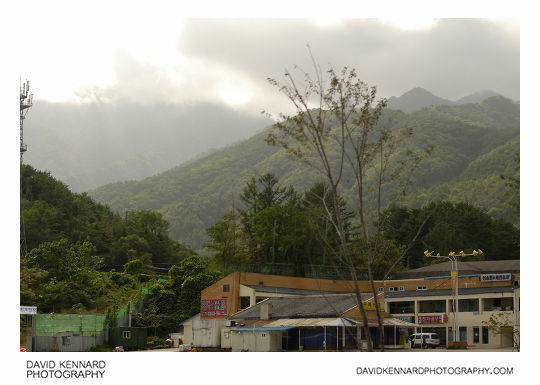 We walked down the road a bit towards the bus stop, and considered booking a hotel so we could spend more time than just one afternoon at Seoraksan National Park, but in the end decided against it. We got the bus, and when it got near to Seoraksan there were lots more hotels again. Obviously the park is a very popular area. In the photo above you can see a couple of the buildings that make up part of the Seorak village area, but the whole area of hotels is actually quite large. Eventually the bus came to a car park near the entrance to Seoraksan National Park, where it stopped and we got off, along with the other passengers. And here ends the photos taken from buses. If you're interested in the processing of these photos, I had to adjust the white balance on all of them to compensate for the blue tint of the bus windows. And they all required quite large curves adjustments to increase the contrast. In the next post I'll have some photos from Seoraksan National Park.